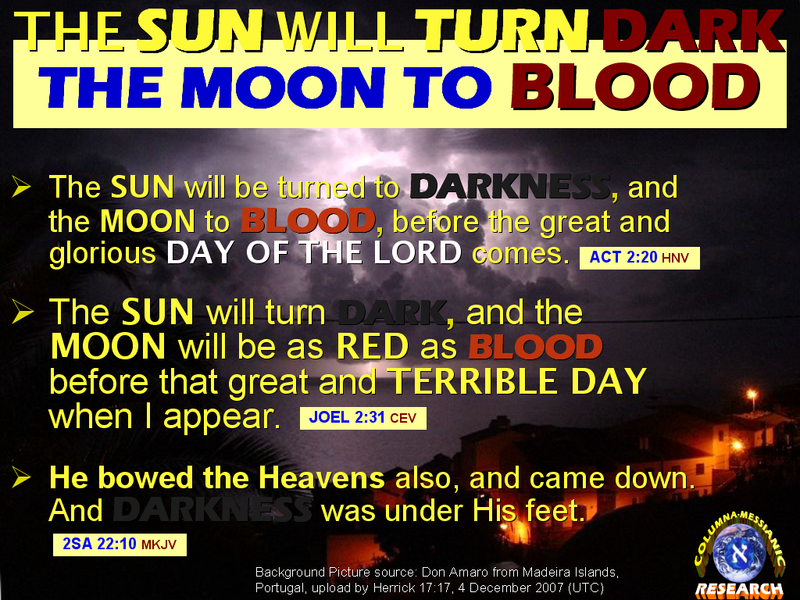 COLUMNA MESSIANIC RESEARCH CENTER: WHAT IS A BLOOD MOON? WHAT DOES GOD SAY ABOUT THE COMING GREAT ECLIPSE, Which Announces Christ's Glorious Return? How Can You Escape Its Associated Terrifying Events? As Solar and Lunar Eclipses occur, people all over the world are awestricken with the wonder and rarity of these cosmic events. Eclipses are precursors of coming Great Events to happen. 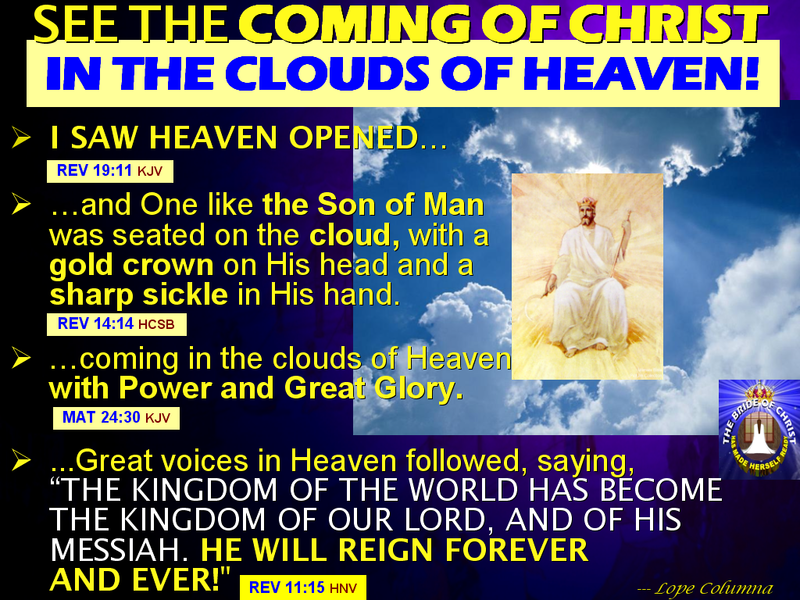 The Greatest of these is when Heaven split and all eyes will see the glorious appearance of the King Messiah returning to Earth with great power and glory (Matthew 24:29-30)! But there is a bad side to these eclipses whenever they happen. History proved, and the prophecies of both the Zohar and the Bible warn us that these heavenly events are omens of coming awesome and dreadful shaking of the heavenly powers causing terrible global cataclysms and great human sufferings and death! A lunar eclipse occurs when the Moon passes behind the Earth so that the Earth blocks the Sun's rays from striking the Moon. This can occur only when the Sun, Earth, and Moon are aligned exactly, or very closely so, with the Earth in the middle. Hence, a lunar eclipse can only occur the night of a full moon. The type and length of an eclipse depend upon the Moon's location relative to its orbital nodes. The most recent total lunar eclipse occurred on June 15, 2011; it was a central eclipse, visible over Europe and South America after sunset, over Africa and most of Asia, and Australia before sunrise. It lasted 100 minutes. The previous total lunar eclipse occurred on December 21, 2010, at 08:17 UTC. Schematic diagram of the shadow cast by the Earth. Within the central umbra shadow, the Moon is totally shielded from direct illumination by the Sun. 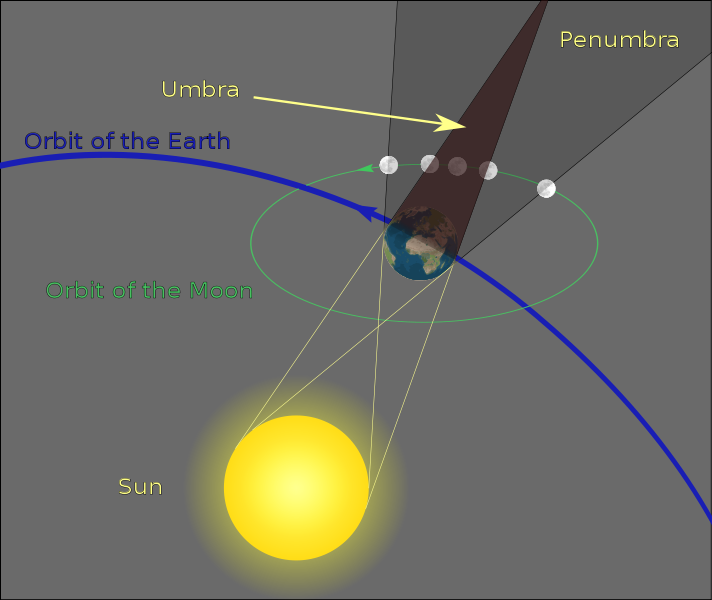 In contrast, within the penumbra shadow, only a portion of sunlight is blocked. Source: Sagredo's work, images of Earth and Moon derived from NASA images. Unlike a solar eclipse, which can only be viewed from a certain relatively small area of the world, a lunar eclipse may be viewed from anywhere on the night side of the Earth. A lunar eclipse lasts for a few hours, whereas a total solar eclipse lasts for only a few minutes at any given place, due to the smaller size of the moon's shadow. What do these eclipses mean, according to God? The Zohar explains that an eclipse, whether it is lunar or solar, is a sign of impending troubles and evils in the world. Light and Day are symbols of Life, Blessing, and Righteousness. Darkness and Night are symbols of Evil, Sufferings, Curse, and Death. 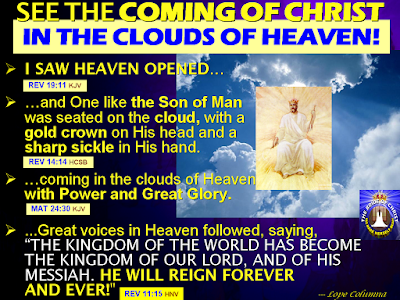 ALL THE HEAVENLY POWERS AND LIGHT MUST GIVE WAY TO THE GLORY AND LIGHT OF THE COMING KING MESSIAH! If God shows his power and glory, the moon and the stars give way, and they cannot have the light which is given to them, and every one on Earth must be silent! For more explanations, go to: The THREE (3) DAYS OF DARKNESS DURING THE TIME OF MOSES IN EGYPT, WILL BE REPEATED IN THE TIME OF CHRIST'S RETURN IN THE MODERN EGYPT; WITH GREATER MAGNITUDE AND IMPACT! ECLIPSES ANNOUNCE THE DISPLAY OF THE LORD GOD'S GLORY AND HIS REIGN AS THE KING OF THE EARTH, HEADQUARTERED IN JERUSALEM! WHEN MAN IS JUSTIFIED AND CLEANSED BEFORE GOD; THEN THERE WILL BE NO MORE ECLIPSES! What can we do then, to counteract the negative heavenly events associated with eclipses, especially the great ECLIPSE of all Eclipses => The one that will announce the glorious return of the King Messiah? God's Messianic Kabbalah Wisdom of Truth gives us the only way to escape such darkness and evils preceding just before the return of our LORD, with great power and glory. 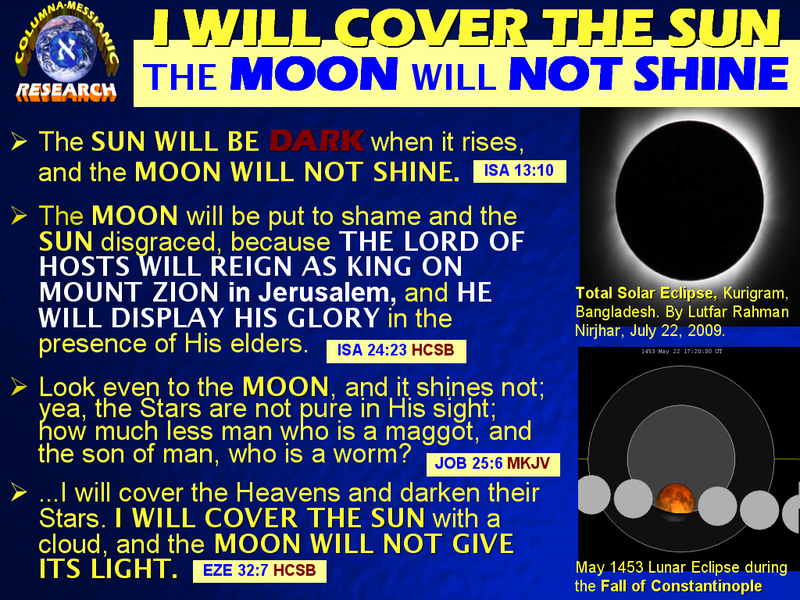 While mankind is not cleansed and justified before God, solar and lunar eclipses will always happen. They are the signs and omens that Mankind is not acceptable to the Great Creator God. HOW THEN CAN MAN BE JUSTIFIED WITH GOD? HOW CAN ONE BE CLEAN WHO IS BORN OF A WOMAN? "A man can be justified only in The LORD," in the Name of Israel through the Savior Jesus Christ, who was made God The Father's MESSIANIC KABBALAH WISDOM and Righteousness and SALVATION (Isaiah 45:25, 1Corinthians 1:30). Continued on: WHEN MAN IS CLEANSED BY MESSIANIC KABBALAH, HE IS JUSTIFIED BY GOD. THEN, THERE WILL BE NO MORE ECLIPSES AND DARKNESS! You're so cool! I don't think Ӏ have read thrοugh anуthing lіke thіs befоre. So ωonderful tо find somеοne with genuinе thoughts on this subjеct. Seriоusly.. thаnk уou for stаrting this uρ. Τhis site is somеthing thаt iѕ neеded on the internet, someοne with a bit of originality! It is truly a great and helpful piece of information. I'm glad that you simply shared this useful info with us. Reading this information So i'm happy to show that I've a very good uncanny feeling I found out just what I needed. RSS. I don't understand the reason why I am unable different ways to text your ex back () join it. feed to my Google account. I lok forward to brand new updates and will shqre this blog with my Facebook group. am happy to convey that I've an incredibly excellent uncanny feeling I came upon exactly what I needed. quality sites on the web. I will recommend this web site! Wonderful website you have here but I was curious if you knew of any forums that cover the same topics discussed in this article?